← Iron Man or Son of Man? “The blood of the people is being poured out like water in Jerusalem”. This was true during the time of this Psalm, and unfortunately it is increasingly true all over the world today. God is not absent so why does he not act to prevent the bloodshed? I do not know. Perhaps this is one of the questions that will be answered when the veil is lifted between us and God and we are able to see Him face to face. 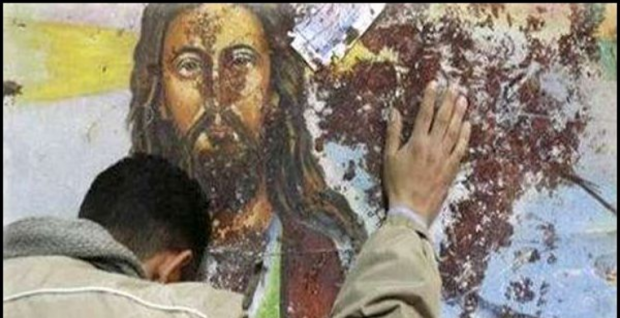 I think that, just like the Jews during the time of Jesus, we want a mighty messiah who will avenge the spilled blood. What we got was a Messiah who spilled His blood for us instead. The battle is a spiritual one for our souls. The physical pain and shed blood, although heart wrenching and horrendous to our earthly eyes, are a mere distraction from the spiritual battles being waged for our souls. A common explanation for the reason bad things happen to those who are following God is that we live in a fallen world. God did not say that in following Him we would avoid earthly trouble, in fact Jesus said essentially that if we choose to follow Him we are almost guaranteed to experience trials and tribulations. But take heart Jesus has overcome the world (John 16:33). The spiritual battle is won not by might but by steadfast souls unwilling to give up on our Savior, and a Savior unwilling to give up on us. In the end God wins. Prayer: It is hard to see your followers persecuted for the the love they show for You. Bring us peace through your Son Jesus. This entry was posted in Christian Community, Christian Leadership, Christianity, Conflict, Covenant, Death and Dying, Discernment, Discipleship, Faith, Following God, Healing, Obedience, Psalms, reconciliation, Redemption, religion, Sin, The Nature of God, The Spiritual Realm, Trusting God and tagged bible, bible study, Christianity, Daily devotional, persecution, water. Bookmark the permalink. 7 Responses to Where is their God? It’s hard to see everything that’s happening, because I feel helpless to do anything about it. Then I realize the sheer folly of saying “it’s hard” for me to sit here in peace and comfort and feel bad about the suffering others are actually going through. The tragedy our brothers and sisters experience is beyond my comprehension… maybe that’s why it’s so easy to find and follow distractions than to actually reflect on what’s happening around the world.